Hello, everyone! Normally, I write our resident series on the underrated and underappreciated, The Underdog’s Corner. For today though, I hope you’ve got your popcorn ready because it’s time for another set review! If you haven’t been keeping up with the news, the newest “draft inovation” set Battlebond is releasing two weeks from now! So why should you be excited? Because the last two black-border “draft inovation” sets were Conspiracy and Conspiracy: Take the Crown. Both of these sets brought us a number of popular and powerful cards, including many diverse and interesting new legendaries. At this point, we should expect the same from Battlebond, and I’m here to bring you the highlights for what Red has to offer this time around! If you take a look at EDHREC’s themes page, you’ll notice that the 7th most popular theme is spell-slinger. If you look at the signature cards for this archetype, you’ll notice the number one card is Primal Amulet. If we dig deeper down the page, we’ll notice that two of the top three listed instants are Reverberate and Increasing Vengeance. The top enchantment of the list? Swarm Intelligence in more than 800 decks. Copying spells is a powerful tool in a spell-slingers arsenal, and that’s why we’re talking about Bonus Round. The first thing we need to take into account is that Bonus Round copies every instant and sorcery for a single turn, including your opponents’. For non-blue colors, the majority of spells that will be copied this way will be removal spells. This card can be dangerous if casting this spell is viewed as a threat, but it also can be used politically to remove multiple problem permanents. Next, its mana cost. This costs one mana more than most Twincast effects. To really get value out of this card, we need a deck that can cast at least two spells after we play this. 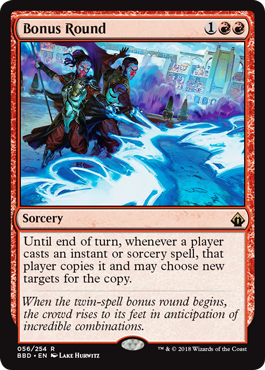 If you’re on average doubling only one spell, you’re wasting a deck slot on this as the Twincast variants do the same thing for cheaper and with the versatility of copying any player’s spell at instant speed. However, in the decks this will be played in, that issue shouldn’t come up. 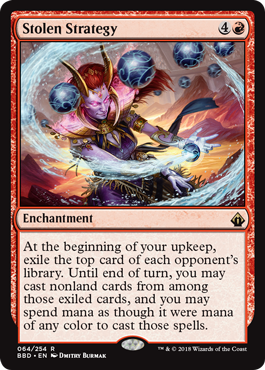 Mizzix of the Igmagnus and Kess, Dissident Mage will both do incredibly explosive things with this card. Mizzix being able to double every spell that is played on top of her cost reduction in play is terrifying, and Kess’ toolbox only becomes more powerful as well. I’m sure there’s going to be a game out there where a Kess player will be able to cast this card twice in a turn only to follow it up with a flurry of tripled spells. Cost reducing permanents in all shapes and form find plenty of homes in EDH, from the narrow to the far-reaching. Sometimes they reduce the price of a type of spell. 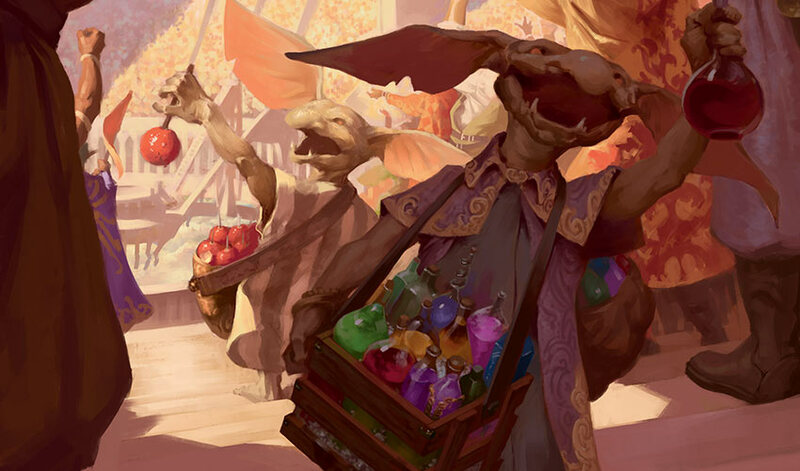 Etherium Sculptor has a home in over 6,000 decks, and Baral, Chief of Compliance is included in over 5,000 decks while also leading around 700. Even more narrow cost reducers like Oketra’s Monument and Bontu’s Monument find homes in over 2,000 decks each. 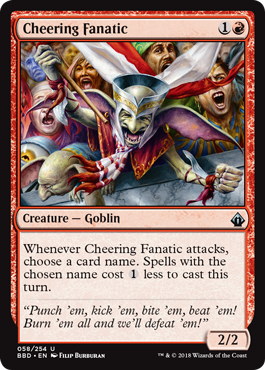 That leads us to talk about Cheering Fanatic. Fanatic may be the most restrictive cost-reducing permanent we’ve seen to date, but does that make it bad? Not necessarily. There are two restrictions we have to consider: its ability triggers by attacking, and it can only reduce the cost of a single spell per turn (usually). Comparing the goblin to even something like Mindstone doesn’t give it a good look. However, there is always inherent value in having effects on a body. This creature can come down early enough to chip for damage as well as ramping you just slightly. Being able to curve from this into Krenko, Mob Boss could certainly swing some games very early. If we want to turn the jank up, we can combine the goblin with extra combat spells to stack cost-reductions. I’m not sure where Cheering Fanatic will find a home, but I’m sure it’s out there somewhere. 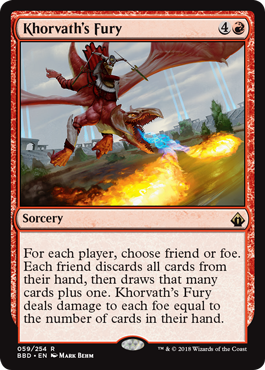 Being Red’s “Friend or Foe” card, Khorvath’s Fury is one of the hardest red cards to evaluate in this set. We’ve seen both of these effects before but never together. The “friend” mode is the same as Chandra, Flamecaller’s 0-ability, while the “foe” mode is a widespread version of Sudden Impact at sorcery speed. Those two effects together don’t mesh too well, and it’s hard to judge how impactful the card will be. Resetting your own hand is good if you need it or you’re playing a Red-based reanimator shell, but is that effect worth five mana? Additionally, hitting each opponent for the number of cards in their hand doesn’t seem impactful for the cost in a vacuum. However, evaluating cards with our commander in mind is something every player does. I think the commander that this card will see the most play in is Neheb, the Eternal. 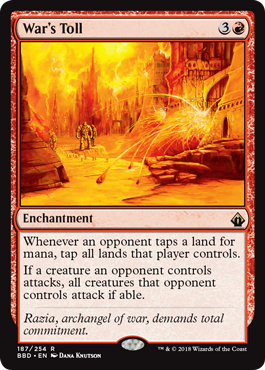 Cycling through cards in our hand in mono-Red is rare, and this card delivers even if it’s a one-shot effect. Traditional wheels are still better for that specific use, but this card will shine brighter in Neheb thanks to its “foe” mode. Damaging each of our opponents and generating at least nine mana on average seems incredibly potent for what Neheb decks are trying to do. Joining the ranks of Burning-Tree Emissary and Priest of Urabrask today is Stadium Vendors. With 500 and 670 decks respectively, ritual-like creatures are not terribly popular in Commander. So what makes Stadium Vendors different? First, we can play politically and use that mana to help an opponent help us, but the downside is that our temporary ally will need to be able to cast spells at instant speed. While these types of politics are risky, the option is still there. 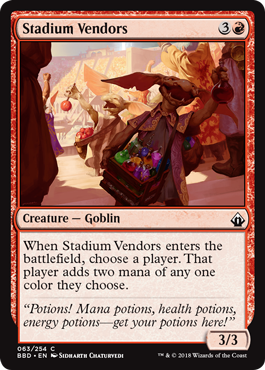 However, the reason that’s even a possibility is that Vendors can add two of any single color of mana to your pool; usually ritual creatures only add their own colors. This gives us a bit more flexibility and mana-fixing at worst. Mostly, I see the vendors acting as a combo piece with Deadeye Navigator, but that’s like saying water is wet. Still, it’s an interaction to be aware of. I don’t think these goblins are going to be a popular choice, but the number of choices they can add to a game makes them at least interesting to consider. Stolen Strategy is my favorite new card in Battlebond without question. Red has historically had the smallest design space that interested me, but in recent history has brought us cards that swing my opinion. It all started with Grenzo Havoc Raiser in Conspiracy: Take the Crown followed by Etali, Primal Storm and Dire Fleet Daredevil in Rivals of Ixalan. Now, we have Stolen Strategy. This enchantment bridges the gap between all three of these cards. At the beginning of each of our turns, we exile the top card of each of our opponent’s libraries. At face value, this still removes cards from our opponents’ decks as small as that advantage may be. After that, we can cast any of them over the course of our turn. Hitting lands will be unfortunate since we can’t play those, but the numbers say we’ll hit more often than we miss. While Etali exiles multiple cards, we’re limited to casting them as his ability resolves; we don’t get a chance to save them. However, with Strategy we can pick and choose which cards we want to play. We could almost play our entire turn with our opponent’s cards if the situation calls for it, or we could not play any of them to completely deny our opponent the chance to retrieve them. This card gives you a lot of options and flexibility as it almost reads as “draw three cards” in EDH. With Battlebond only introducing 85 new cards, two-thirds of the set end up being reprints. While there are certainly very exciting reprints in the set, Red happens to be lacking in that category. However, we did get one reprint that hasn’t seen a reprint since it’s original printing in Dissension. I’ve always wanted to find a home for War’s Toll, but I have struggled to find the right fit for it. It’s a particularly powerful hate piece against reactive decks as the pilot only gets to cast during a single player’s turn, barring mana rocks. Even against proactive decks, it forces a players to commit all of their resources during a single phase. It’s second ability can also put many players in a bind. Sometimes a player will have creatures that they’re ok with attacking, but more often than that they may also have support creatures they’re not willing to throw into the fray. This can certainly put some decks into a bind. Some decks can even leverage this by forcing every creature to attack, like Basandra, Battle Seraph. If you’re like me and didn’t notice it the first time you read the card, War’s Toll is asymmetrical. The owner of the enchantment is absolved from participating in the violence. I’ve never seen this card in action, but I can only imagine it to be a magnet for removal. That’s it! I hope you have enjoyed this review of what Red cards Battlebond is bringing to our great format, and I hope you feel the same excitement for this set that I do. If you noticed the lack of partners, check out the Partner-specific review written by our own Nate Burgess! That’s it for this review!